Quilt made by Chrintina Rueck & Rosina (Schinnerer) Schumm, c1881. 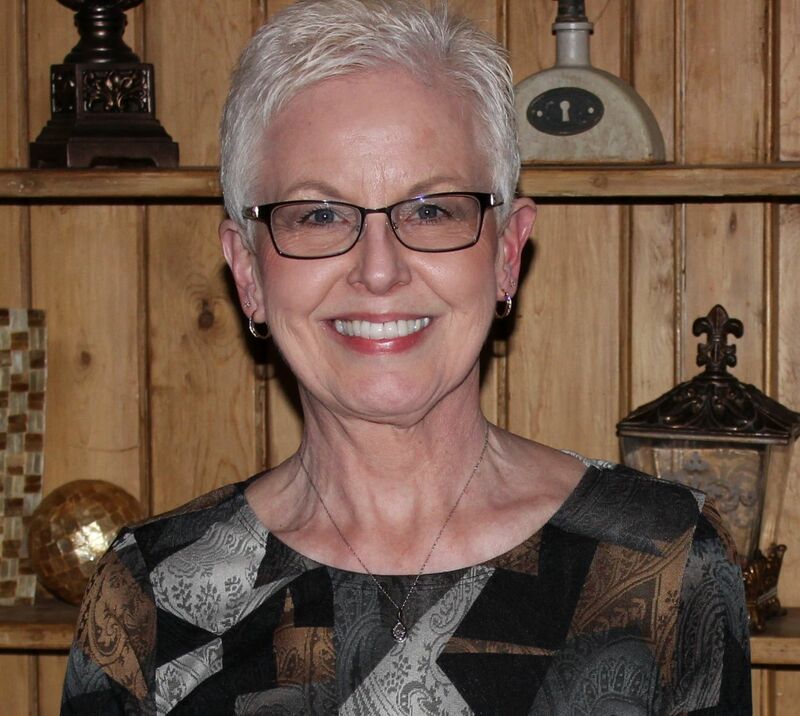 This week I have an interesting story that connects both sides of my family, the Millers and the Schumms, long before my parents were ever married. This story involves my great-grandmother Christina Rueck, before she and Jacob Miller married. It also involves my mom’s side of the family, the Schumms. The Schumms were from Ruppertshofen, Wuerttemberg. Johann Georg immigrated to America with his five children in 1833. They settled a couple miles east of Willshire, in Van Wert County, Ohio, in 1838. Their settlement consisted of the small village of Schumm and Zion Lutheran Church. They also owned a lot of land east of Willshire. The Schumm women in the Willshire area were known for their fine quilting. In fact most of them were avid quilters. Back then women sewed out of necessity but many also liked to quilt. My grandma Schumm also loved to quilt. I remember her talking about quilting with the ladies of the church. 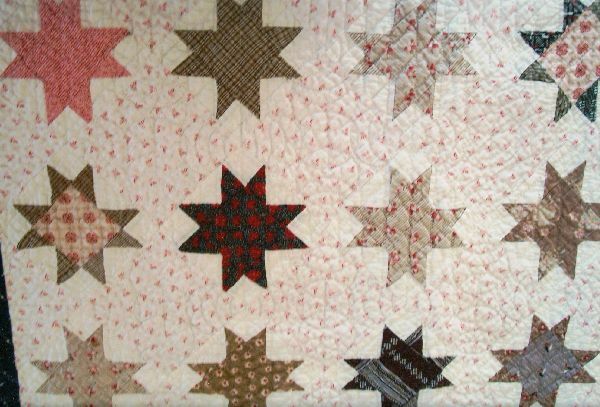 The women would regularly meet at the church or in someone’s home and they would stitch on the same quilt all day long. I’m sure they would catch up on the latest news in the Schumm area while they stitched. That was part of the fun! Those Zion Lutheran ladies made beautiful quilts. Their designs were intricate and their stitches were very small. No machine-stitched quilts for the Schumm quilters! The Rueck family was from Appensee, Wuerttemberg, and they immigrated to America in 1880. Their family at that time consisted of the parents, Jacob and Marie Regina (Gross) Rueck, eight children and one grandchild. Christina was the oldest child in the family. The family settled in Van Wert County, Ohio. In 1881 Jacob purchased 80 acres of land along the St. Marys River. Their property was a little east of Willshire. The Ruecks had settled in the land of the Schumms. The Ruecks lived in the Willshire area for only a couple years. Christina’s family moved to Oregon about 1882 but Christina stayed behind in Van Wert County. She was about 23 years old and she was seeing Jacob Miller at the time. She didn’t want to go out west with her family and leave Ohio and Jacob behind. But Christina needed a place to stay. She stayed with a neighboring family, Henry and Rosina (Schinnerer) Schumm and their family. Henry and Rosina Schumm also lived along the St. Marys River. Henry was known as “River Henry”. This name was to distinguish him from several other Henry Schumms living in the area at the time. 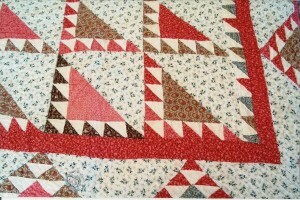 During the time Christina Rueck stayed with the Schumm family Rosina taught her how to quilt. Together Rosina and Christina made these two quilts. Both women worked to piece and stitch the quilts and Christina kept the finished quilts to use in her home with Jacob Miller. 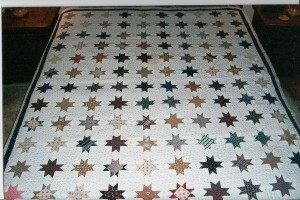 The quilts were made about 1881 and my mother now has them. Quilt made by Christina Rueck & Rosina (Schinnerer) Schumm, c1881. Clara (Miller) Reef, the youngest child of Jacob and Christina (Rueck) Miller, recalled her mother saying, “all the Schumm women wanted to do was to quilt”. Christina learned to quilt from the best quilters around! Christina (1858-1945) was my great-grandmother but what was my relationship to the River Henry and Rosina (Schinnerer) Schumm? This gets a little complicated because I am related to the both the Schinnerers and the Schumms, so I am related to both River Henry and his wife Rosina. Rosina (1854-1890) was my great-grandaunt. She was the daughter of Frederick Schinnerer and his first wife Margaretha Deier. Frederick and Margaretha were from Ipsheim, Bavaria, and they immigrated in 1849. They first lived in Mercer County, Ohio, near Rockford, and later moved to Van Wert County, east of Willshire. River Henry (1844-1922) was my great and great-great-granduncle. He was the son of Johann “Ludwig” Schumm, who was one of the Schumm immigrants. River Henry married Anna Magdalena Geissler (1868-1946) after Rosina’s death. 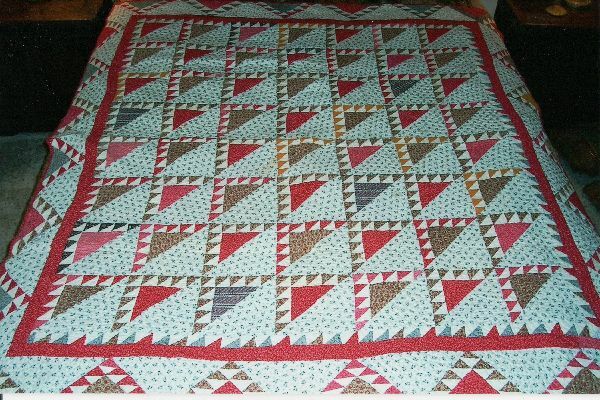 Christina Rueck and Jacob Miller were married in 1882 and the quilts were stitched before they were married. These are photos of the two quilts that Christina and Rosina made together. These two beautiful quilts have this very special connection to only two people in the world–our son Jeff and me! That makes them pretty special indeed! Unfortunately, I have not inherited the quilting gene. I can sew and I used to like to sew a lot, but not anymore. I don’t even like to hem a pair of slacks these days. I would never have the patience to make a whole quilt. All that precise cutting and tiny stitching–not for me. About the only needlework I enjoy is counted x-stitch. Does that count? Thanks so much! 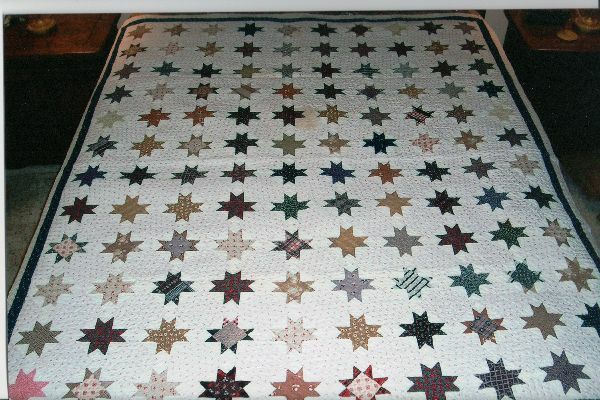 The quilts are in very good condition. 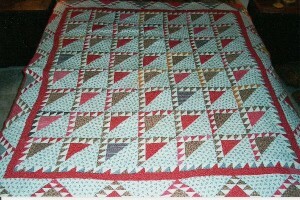 Old quilts are so pretty. Beautiful story, which I will hand down to my grandaughters!